At 3:37 a.m. I was suddenly awake. The sound was coming from the basement. The pinfire Pepperbox got slipped into the secret pocket of my bathrobe. Down the stairs. The sound was coming from the bomb shelter the Art Director had installed. When the 10 inch thick steel door swung open, the sound of the theramin stopped abruptly. I was suddenly awake, and checked the time on the clock. With the amount of mail the magazine receives, we have had to rent a warehouse so that we have room to continue typing. Cleaning staff here at our offices play a game called: GUESS THE CURRENCY. As you know, most of the mail we receive contains socks or currency. It was thought that an envelope that arrived recently was stuffed with Japanese yen (the third most traded currency in the world). 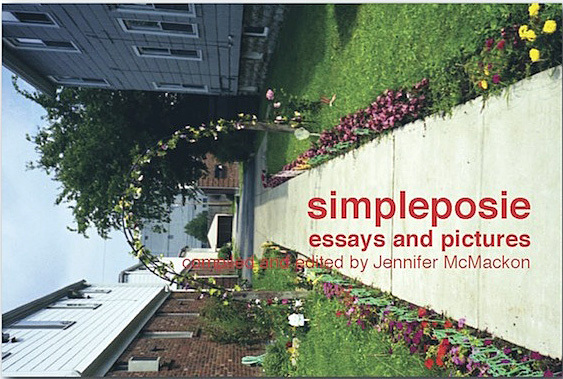 We were delighted not to have to make another bank deposit, and spent some quality time reading simpleposie, essays and pictures (ISBN 978-0-9866848-0-7). Simpleposie is functional, sincere and from Toronto. Visit them. be clear in your thoughts. We'll find you Pillowhead. We will.